There's something quite beautiful about the amalgamation of the materials wood and concrete within an interior design. Taking one strong gift from nature, and the other a strong triumph of man-made ingenuity. 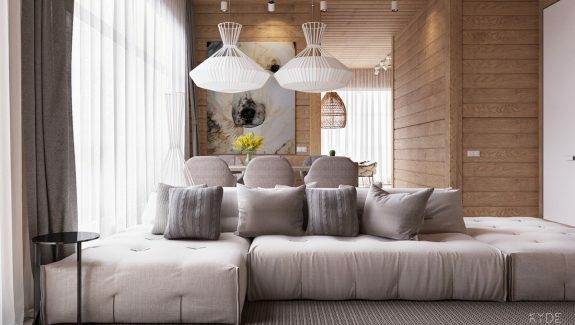 The warmth and texture of natural wooden elements just sing against the cold hard drama of gray concrete in a home decor scheme, allowing each element a moment in the spotlight. 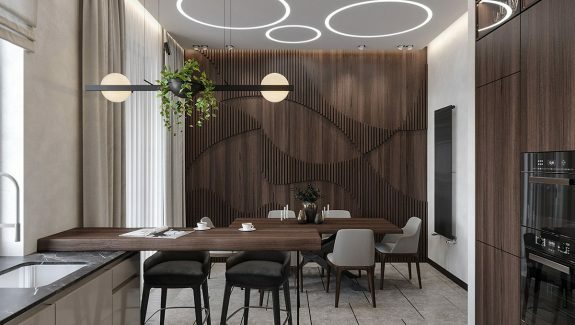 Here, we have a great opportunity to tour not one but four different home designs that each incorporate the wood and concrete duo to excellent and individual effect, showing the visual versatility of the combo. Let's take a look around. A sectional gray sofa picks up on the hue of the concrete whilst a black coffee table and matching pitcher take the color story a little darker. A set of vibrant yellow modern dining chairs really zing against another backdrop of moody gray over a mixed tone wooden floor. A large metal chandelier overhead provides another eye-catching statement piece. A dominating wall of concrete slabs provide an atmospheric mount for a piece of highly colorful modern art. A stand-alone piece of designer furniture adds to the gallery tone. The wooden floor here provides all of the warmth, transforming the space into an inviting area where you might just stay a moment to appreciate the curation. In the bedroom it’s the wardrobe that ties in with the gray concrete wall, along with the plain bedclothes and simple pendant light shade. A textured area rug anchors the scheme whilst a vibrant canvas injects a hot energetic splash of red. Along with the bedroom pendant, a modern angular bedside table lamp on the side unit brings illumination and ties in perfectly with this edgy decor scheme. Simple bathroom decor benefits from the added interest in these , by Seppo. The effect is doubled by the presence of a long landscape mirror over the vanity unit. The shower area is clad with wood, an unusual choice for a wet room. A curvaceous bath tub compliments the shape of the twin wash basins and works to soften the visual of hard angular architectural lines. A stylish soap dispenser nestles neatly beside the basin, whilst the faucets are wall mounted above. The living area of our second apartment, designed in Kyiv, Ukraine, has a slightly softer look achieved with the introduction of leafy indoor house plants. A tall (Ficus lyrata) entirely fills one corner of the room. A large print of a palm tree injects more nature into the scheme. A multi patterned area rug marks out the seating area. A matching duo of unique coffee tables form a useful centrepiece in the lounge. Illuminating the large feature plant are some unique floor lamps. Differing sizes of by Sebastian Herkner help decorate an otherwise disused corner. A projector screen makes a versatile viewing option as it can be retracted from view in a moment, unlike a large wall mounted TV. The copper lining of these dining room pendant lights shine in a concrete and wooden scheme. The copper lights are complemented by the earthy tone of the upholstered modern dining chairs. A wall of living greenery breathes life and uplifting color into the room. Black kitchen bar stools match the countertop. Our third space, another from Kiev, Ukraine, is a smaller proportioned 87 square meter apartment. Here we see a shrunken seating area in a studio kitchen setting. Decorative vases liven up the coffee table. 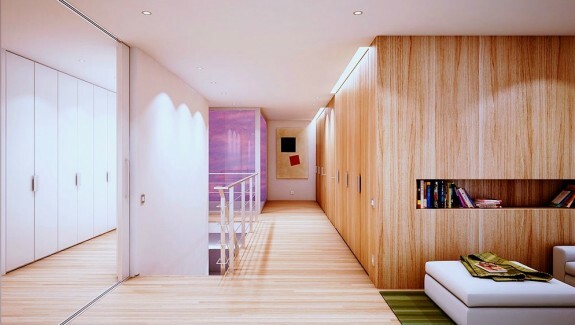 The small space benefits from the installation of visually interesting lighting options. A long armed wall light extends over the lounging area and dual layered dining room pendant lights mark out the eating zone. The dining room chairs bring a hit of turquoise to the interior. The injection of turquoise found in the dining area is echoed in a small home office by the inclusion of a turquoise coffee table. The desk is lit by a unique table lamp. A stylish desk chair adds further interest to the work area. 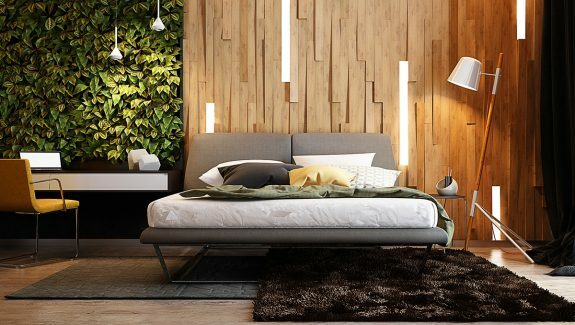 These colorful modern lights add a pop of color in a wood clad bedroom. This kid’s bed provides lots of storage to keep things neat. An upholstered platform bed fills the master suite. A white faucet matches the stark kitchen units. Gray walls contrast with white sanitary wear in this sleek and sophisticated bathroom. Wooden storage cubbies complete the look. Our fourth and last home is a loft apartment designed in Moscow, with industrial home decor in the living and dining areas, composed of exposed brickwork and pipes, rough plaster and concrete. The room is flooded with light from large windows. industrial style lighting provides illumination at night. The industrial style dining room seats eight. The simple wood and metal furniture is of a minimalist nature.